Which month do you think is the most volatile of the year for US equity markets? October likely comes to mind, given that three notable market crashes happened during that month in 1929, 1987 and as recently as 2008. By some measures you’d be right. For example, the VIX has peaked in October during 5 years since it was created in 1990. But did you know the same goes for August? The only difference is the VIX has never troughed in October, while it has twice in August. Fortunately, markets got through last month unscathed and the S&P even made a new all-time high. So what about the balance of the year? If markets experience greater volatility, it will likely happen between now and November. The VIX has peaked twice in September (no bottoms), five times in October (no troughs), twice in November (3 lows), and just once in December (8 bottoms). August through November is the most volatile time of the year for US equity markets using this measure as well. October has had the greatest number of down +3% days with 17 over the past six decades, followed by September (13), August (12), and November (11). That compares to as low as 3 for May and December respectively to as high as 9 for February. The balance of months fall within that band. 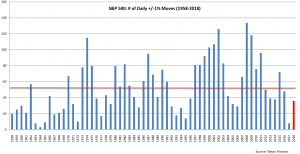 Aside from two days where the market fell 3% or more in November 1973/1974, all other volatility of this magnitude during September through November occurred in the years after 1980. Most of these days happened around various financial crises, such as the flash crash of 1987, the dot com bubble burst/Iraq war in 2001/2002, the financial crisis in 2008, and Greek debt crisis in 2011. The upshot: most US equity volatility of 3% or more centers around an economic/geopolitical shock. This month and the next two haven’t experienced a down +3% move since 2011. So while these next few months tend to be most volatile, it will likely take similar macro events to create outsized moves of 3% or more. As for why such catalysts seem to strangely cluster in just 3 months, your guess is as good as ours. So far this year, the S&P has only gained or lost 1% or more on 36 days, compared to the average of 53 for each year dating back to 1958. It has been an unusually calm quarter thus far. The S&P hasn’t experienced a 1% day since June 25th. Therefore, Q3 has had no 1% days yet compared to the average of 13/quarter over the past six decades. The average number of 1% days for the fourth quarter is 14. A few one percent days this month and an average Q4 of volatility could put the S&P on track for an average year of 1% moves. That said, for all the negative headlines this year especially related to trade policy, US stocks have been notably calm. Bottom line, US equities have experienced lower than average volatility of late, but this month through November could change that narrative. It would likely take an economic shock (unlikely) or a geopolitical shock (perhaps an escalation in trade wars although also unlikely with mid-terms coming up, or contagion spreading in Emerging Markets) to cause outsized moves in the S&P. We don’t expect the S&P to trade as quietly as it has the past two months, but we also maintain our positive outlook for US stocks the rest of this year.